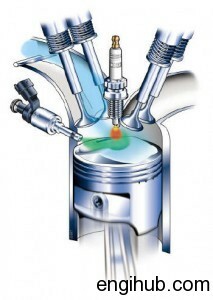 There are different Ignition Systems used in engineering by which Fuel may be ignited in Internal Combustion Engines. If the Ignition in Internal Combustion Engine takes place at the end of Compression Stroke then the engine runs without knocks, with good efficiency. The Compression Ignition Engine is so designed that the temperature at the end of the Compression is above the self-ignition Temperature of Fuel. In this case (ignition system), no spark plug as like in Spark Ignition required for Ignition. This is the old method which was used in old days, now this method has become obsolete. But to gain some information, here I disclose the description. This method used in Gas and Light Oil Engines, a porcelain or metal tube closed one end is heated red hot from an external source, to Temperature well above the Ignition Temperature of the Fuel so that when the latter is injected into the tube it immediately ignites. The tube is heated in the middle, through a Timing Valve. The hot tube communicates alternatively with the Cylinder when Ignition takes place and with the Atmosphere during expansion. In some Gas Engines, this Timing Valve has been dispensed with and the ignition tube is in free communication with the Cylinder throughout, the instant of firing being determined by Compression of some of the Explosive Mixture into to the tube. As the Engine starts the heat of the tube from the previous explosion is sufficient to ignite the Fuel in the next cycle. This method is mostly used on Engine working on “Otto Cycle”. And consists in ignite the Fuel by producing a high tension Electric Spark. The Engines which are using this type of Ignition method are called “Spark Ignition Engines”. In which one Spark must be produced at each cylinder at the correct moment. Another name of this method is “Surface Ignition or Hot Surface Ignition”. This method is used in Engines working on “Dual Combustion Cycle”. The fuel is ignited by being injected into a Hot Tube or Combustion Chamber containing Compressed Air. The bulb which is located at the compression end of the Engine Cylinder and connected by a narrow space or throat to the combustion space of the cylinder is in jacketed and initially heated from an external source, like Lamp. At the end of Compression Stroke, the Fuel is injected comes in contact with the red-hot bulb and thus the ignition commences. This method is used in heavy oil engines working on Constant Pressure Cycle (Diesel Cycle). The Air is compressed to such a high pressure that its Temperature is higher than that at which the fuel burns. The Fuel is then injected into this hot compressed air where its ignition starts spontaneously. In Hot Tube Ignition and Hot Combustion Chamber Ignition, the exact point of the cycle at which ignition commences is quite uncertain. This problem does not occur in Compression Ignition system. I hope the information above will help you to understand the ignition systems of the engines.